The Craftery household got a new front door last week. It’s pretty exciting because our door hadn’t opened smoothly since we bought our home a year ago! The new door is a simple craftsman style that lets tons of light into our entryway, and I just love it. But still, I think nothing makes a front door look as finished as a wreath. 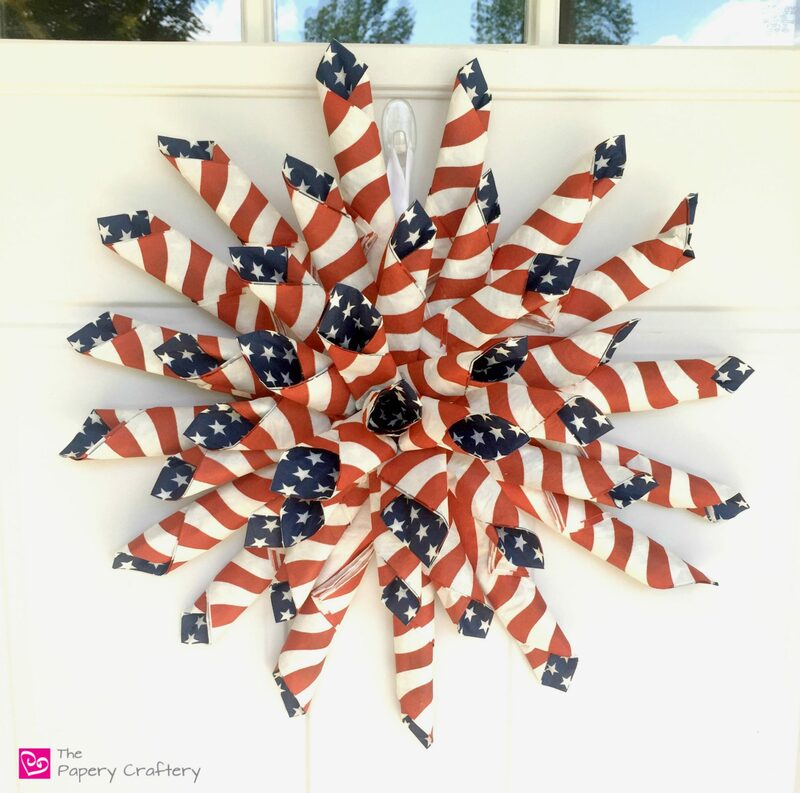 So I set out to make up a quick patriotic paper wreath to hang all summer long! I was completely inspired by these American flag paper napkins I found at the Dollar Tree. If you don’t have a Dollar Tree nearby, or they’re out of stock, check out these similar flag napkins. Even though I wasn’t 100% sure how I was going to use them at the time, I bought 3 packs of 20 napkins each. For this wreath, I used about 2 1/2 packs. I also used my beloved Tacky Glue, my favorite glue gun, some leftover cardboard, and white ribbon. To make a super simple base for your door hanging, cut a square of cardboard, about 6 inches by 6 inches will do. Since this is just a paper wreath, no heavy duty hanger is needed. I cut a small slit in one corner of the cardboard, and threaded a 8″ length of white ribbon through. A simple knot on the back will stop the ribbon from coming back through. Like I said earlier, I didn’t really have a plan when I started this door hanging. So I played around a bit, and soon realized that I could simply roll the napkins. They looked similar to the book pages used to make wreaths that are so popular on Pinterest right now. And, I could roll them in a way to have the stars peek out from all the stripes. First, place a napkin with the stars to the left, and the opening of the napkins facing the bottom. Next, fold the top down about 3/4 of the way to the bottom, but don’t crease. Holding the top in place, bring the bottom of the napkins up and over. Keep rolling the end all the way around without pushing too hard. You don’t want to flatten the whole roll! Glue all the ends with a bit of Tacky Glue. Hold for a few seconds until the napkin stays rolled. That’s it! Simple stars and stripes paper rolls! Start by hot gluing four rolls facing the corners of your cardboard base. Then, add a roll between each, so you have a total of 8. I would recommend using a line of glue where ever the roll will meet the cardboard to make sure everything stays put. Fill in the spaces between the rolls from the last step. Take a break for cuteness! My helper decided to make his face “like the Hulk’s”. He’s just too adorable! Start building your wreath to have more of a dome or “dahlia” shape. To do that, make the rolls in the same way, but cut about 2 inches or so off the bottom. Your rolls should stay together. But, add a touch of extra glue if need be! Keep building your wreath in a starburst pattern, trimming the ends a little more as you get to the center. There’s no real science to this part. I just tried to keep all my rolls evenly spaced. I also made sure I was happy with the placement before I glued each level. TIP: If your napkin rolls aren’t standing up in a way that you like when you get to the center, use extra hot glue behind and under them to give them a boost! Add a final roll right in the center to complete the pattern. And she’s ready to be hung! Simple, but eye-catching, I think this patriotic paper wreath is the exact thing our new door needed! All in all, this project took about 40 minutes (including that break with the Hulk) and, since all I had to buy new was the napkins, it cost all of $3. This same technique would work with any pattern napkin or other type of paper for other seasons. You could even add a lot more rolls to make the door hanging much more full. Maybe use a few colors for more of a flower effect! In the meantime, I hope you’ve been inspired to play with some paper napkins to make your own door hanging! I LOOOOVE doing crafts with what I’ve found at the dollar tree!! I swear they’re the best dollar store ever. It came out so cute!! Thanks Julie! Check different Dollar Tree locations if you have a few nearby, like I do. I’ve found some have a lot more choices than others! This is so cute!! I can’t wait to try it! I hope you do! It really was quick and easy! This is super cute!! I would have never thought to use napkins to make a wreath. This is a inexpensive and easy way to dress up your door for any holiday. Thanks! I haven’t done it before either, but the napkins are holding up really well on my door so far! I never would have thought to do this. It’s so cute! You could do this with all sorts of seasonal napkins! Thanks so much! It’s true; there are all kinds of pretty, decorative napkins out there! Right?!? Finding a really inexpensive way do make something is one of my ultimate goals.